After more than three months, the labor dispute surrounding the closure of the biggest garments factory at the Cavite economic zone was finally settled. As the massive fire at the factory of the House Technology Industries burned last week, the management and union of Faremo International Inc. signed an agreement at the Cavite ecozone administration office to end the labor row. “The deal provides for the rehiring of the workers if the factory reopens, a substantial financial assistance on top of the separation pay and the grant of several sewing machines for a livelihood project of the displaced employees. 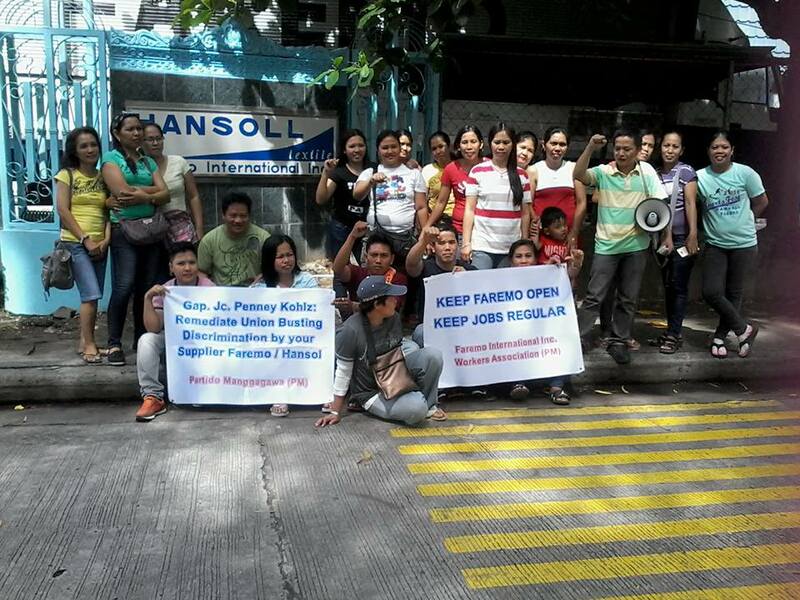 It was a resounding win for the workers,” declared Rene Magtubo, chairperson of Partido Manggagawa (PM). PM assisted the Faremo workers in their months-long picketline inside the Cavite ecozone. Last October 26, some 1,000 workers of Faremo, majority of them women, were laid off when the factory closed down allegedly due to lack of orders. However, one of its customers, a major global garments brand, admitted that orders were increased not cancelled. This disclosure emboldened the resistance of the workers and bolstered the accusation of the union that the closure was illegal and meant to bust the union and break the collective bargaining agreement. “Illegal closure is a weapon of last resort by employers in their union busting bag of tricks. Faremo is not the first and probably not the last. Last May, the Cavite ecozone electronics firm Seung Yeun Technology Industries Corp. filed for shutdown when its workers unionized but is still operating under a new name. The same modus operandi was done by the Mactan ecozone factory Blaze Manufacturing Corp. in 2011 to bust the two unions of its regular and contractual workers. We have reported these violations to the International Labor Organization Direct Contact Mission (DCM) that is in the Philippines at the moment,” Magtubo clarified. The ILO DCM is a follow up to the High Level Mission conducted in 2009 to investigate the Philippine government’s violations of Conventions 87 and 98 on freedom of association and the right to collective bargaining. The ILO DCM is holding a briefing this afternoon in Manila. Autida revealed that the union will continue to exist as an organization for mutual aid and protection and to manage the garments production that they will undertake as a livelihood project. “We are asking the Department of Labor and Employment to help us in our garments making project. This is one way to sustain the livelihood of former Faremo employees and other displaced garments workers in the Cavite ecozone,” he explained. The union has dismantled its picketline outside the Faremo factory and also withdrawn its pending cases at the National Conciliation and Mediation Board and the National Labor Relations Commission as part of the settlement agreement.